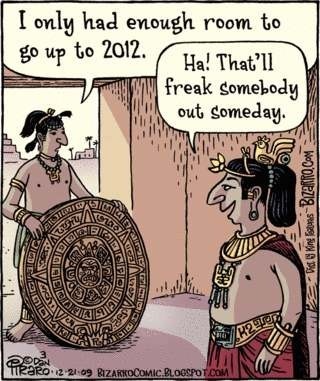 Mayans and Liberals Got it Wrong? Well, here it is. December 22nd, 2012 and we're all catching another sunrise. But for centuries, people all over the world lived their lives with that little thought poking through the backs of their minds that asked, "What if the Mayans were right?" The Mayans were right. The Mayan calendar factually represented a phase of time in the course of the history of our civilization. Our sun was at the high point of an eleven-year cycle of solar activity (read MSE or Mass Solar Ejection) and, at some point during the day of the twenty-first, the sun was aligned along the galactic center. This is something that happens only once every twenty-six thousand years, so it was quite a special event. My personal belief? The Mayan people, for the most part, went extinct before they started another calendar. And why would they continue the calendar they made. They did not make a calendar to cover the millions of years before their civilization came into being. They did the same thing most other religions do, they used a "creation story" to explain how the world as they knew it came to be. So, the Mayans did not necessarily have it wrong, we just interpreted their calendar incorrectly. Much the same as we are interpreting the current and sudden debate on our gun control laws. Yes, I'm going to go there. The recent events at Sandy Hook Elementary and the surrounding community of Newtown, Connecticut were tragic, to say the least. Unfortunately some politicians, including our President, have chosen to use this tragedy to promote their own agendas. Wait, don't stop reading just yet! Let me explain. First, I am an advocate of proper control of the distribution of weapons of mass murder in our country. I believe that lawmakers should engage in meaningful discussion and debate over what types of firearms and high-capacity magazines should be made more difficult to obtain, if not illegal. But now, so close after this time of tragedy and pain, is not the time to begin this discussion. Lawmakers should be concentrating wholeheartedly, on the fiscal crisis that faces our nation. I do not make this statement without reservation. I do not want to lessen or demean the importance and impact of this recent tragedy, I'm just not happy with the event being turned into another play on the field of political football. The political discussion, opened by our president and supported by millions of citizens currently overcome with emotion from the recent tragedy, was all about assault weapons. I'll use the three major shootings recently in the news (although there have been others) as an example to lead you to the fact that the only assault weapon (mock assault rifle) used in these shootings was in Aurora, Colorado. The most recent shooting involved no assault weapons, so why open the discussion with them? True assault weapons are already difficult to obtain. The so-called "Gun Show Purchase" debate is meaningless. The rules of purchase do not change if buying any gun at a gun show. This non-truth is just another play to stir the emotions of unknowing citizens. The answer is simple: It is politically advantageous at this time. It has nothing to do with what is right or wrong for the American people, it served only as a means to attempt to push through legislation using the highly volatile emotional state of citizens at this time. I personally have no need for an assault style weapon and couldn't care less whether they are available or not, but one must understand that we live in the real world where these weapons have already been manufactured. If you make ownership of such a weapon a criminal act, studies from many countries enacting such legislation (beside Australia. More on that later) have had minimal impact on the number of crimes committed using such weapons. Why? because crimes are usually not committed by law-abiding citizens, and when they are, the citizen, having been law-abiding and registering their gun properly, is held criminally responsible for their actions. I must also add that, in most of the countries in which these studies have been conducted such as UK, Germany, Spain, Greece, Italy, and the Netherlands, laws extend very far beyond just the restriction of assault weapons to rifles, handguns, and in some cases, knives. In these countries, the citizens are almost completely disarmed, yet the impact on the amount of criminal acts using said weaponry has not decreased significantly. How can this be? It is very simple: Making it a criminal act to obtain certain weaponry will not deter criminals from obtaining such weaponry. The only affect will be to make it easier for criminals to perform acts of crime using guns without fear of like reprisal. I know, I got off track but one must understand that, while I would gladly support a meaningful discussion on the possession of assault weapons at any other time, I am fearful that, under this administration, the discussion will be maneuvered far beyond that of assault weapons, and when bills are drafted and signed into law, either by proxy vote, majority vote (like our health care law) or simple executive order, they will cover much more than a simple restriction on assault weapons or magazine capacity. Yes, I understand that all my liberal friends are going to say "but we are a nation of laws" but I will respond with "You have no idea how little separates a nation of laws from a nation of social monarchy." Most of my military friends understand, that is military who have actually been in foreign nations and had to move among truly lawless peoples, If a criminal decides to take your possessions, your virtue, your life, the only way to preserve that which you love is by force because I guarantee you, that is how they will be attempting to take it. Keep in mind that the deranged shooter in Aurora, Colorado chose the theater he would commit his crime in out of six others within a twenty-minute drive from his apartment. One was closer than the one he chose. And, although this was likely not reported by MSNBC, CBS, ABC, or even CNN, the movie theater he entered was the only one out of the seven possibilities that had a posted "no gun" rule within their property. Was it simply chance that the shooter drove past a nearer theater and also avoided the largest theater in the city for the one he chose - unlikely. In the most recent tragedy, it is believed that the young man was enraged that his mother was going to have him committed to a psychiatric hospital. He did not choose assault weapons, he chose what was available. That, my friends cannot be regulated by law. Actions such as this can only be minimized by parents teaching their children personal responsibility and providing them with a moral grounding and a deep respect for life. If you think our government can "ensure nothing like this ever happens again" by simply criminalizing the ownership of certain weapons (of which, very few are actually used in such crimes) then you have already fallen prey to letting emotional feelings get in the way of rational thinking. Please keep in mind that I'm not advocating doing nothing. I personally see no reason to allow ownership of assault weapons and high-capacity magazines but I understand that the act of merely criminalizing ownership of such weaponry will not deter those using them for criminal acts. I also understand that laws are needed to provide guidance of what is right, and clear repercussions if not adhered to, but personal responsibility and moral guidance is only found through the actions of our governmental leadership and our families. Notice, I did not say "Laws enacted" I said "Actions." Military folks have heard this phrase used often - "Lead by example." How do we do this? not by politicizing tragedy and using emotional turmoil for your own agenda, but by doing the right thing at the right time. One simple question: why was this issue not brought up, bills written, and laws enacted from the beginning of 2009 to 2011 when our President's party held a congressional majority? Answer: because it wasn't politically advantageous at the time. If this was something our administration truly considered important, than it would have (and should have) become an issue from the Trayvon Martin incident that our President became personally involved in, or after the Aurora, Colorado shootings. But why no call for "immediate and meaningful legislation" then? For answer, refer last statement in previous paragraph. Now, I promised to talk about the success of Australia's strict gun control laws, so here's my take. There is no denying the effectiveness of Australia's very strict gun control measures but keep one thing in mind. While it is often cited that Australia's success is a call to America to enact stricter laws, Australia is an Island with water serving as a barrier to import of guns and ammunition while America is bordered by two other countries, one of which is notorious for it's lack of true gun control despite its legal efforts. We cannot simply declare guns of a certain nature "illegal" and expect criminals to not still obtain such guns. By doing so we favor gun related crimes with weapons that are not even registered or traceable. To our government: Please don't accuse others of politicizing tragedy, and then use a tragic event to further your own political agenda. Being prior military, I can tell that leadership (when lives are truly at stake) is an awesome responsibility not to be taken lightly. One cannot choose events that warrant a reaction. One can only prepare for such events, react honestly and precisely to events, and TAKE RESPONSIBILITY FOR THEIR ACTIONS. So, let's have the discussion on gun control but let's do it in a truly meaning matter when cooler heads prevail, not simply because it is politically advantageous at the time. Let us not use emotion to drive hasty decisions, let us use emotion to drive meaningful and intelligent discussion about something that is a matter truly unique to America more so than any other country as, unlike the majority of countries throughout the world, America was founded on principles of freedom, uniqueness, the ability to protect oneself and their family, and yes, sensationalism. Hello JL :) Yep, I guess we're all still here. Kinda cool to be here at the start of a "new age". One of my off-line friends is taking the stance of better mental health care to answer the questions of recent shootings. While I agree with her, I don't think that is THE solution to keep psychiatric patients from committing such heinous crimes as mass murder. And no, stricter gun control laws isn't totally the answer either, although it probably wouldn't do any harm. I propose we lessen the incidence of mass murder by reinstating the death penalty. Crazy or not, you kill a bunch of innocent people you deserve to be put to death for the crime. I don't think there is a single solution to the issue. The world is what it is, and until we get the guts to revamp the constitution, stop giving criminals more rights than victims, and make people take some personal responsibility for their actions, we'll continue to see this type of tragedy. One day, some psychotic politician is going to push a button and end the debate. Thanks for your comment, Donna. I was hoping I wasn't coming off as too harsh but I feel like politicians are just using a terrible tragedy to further their own agendas and the agendas of those who paid for their election/re-election. It doesn't matter if they are Democrat or Republican, they all seem to do it. It seems though, that our current administration does it more often than anything I'd seen previously and/or it get less attention from the media. You are so right in your idea that their is no single answer to this problem. While I think a debate on the availability of certain guns in our nation is a step in the right direction, such a debate should not be brought up using the emotional push of recent events. It should be a rational debate by adults without agendas, and should include the whole spectrum of things that might contribute to violence and violent crimes involving guns in our nation. You know politicians JL; use available fodder and don't really care about the impact as long as they get re-elected on a sentiment. Nope, I didn't see this as harsh at all. I like to see people take a stand. Seems we made it despite having run out of calendar time. And now that's done, happy 2013 to you!